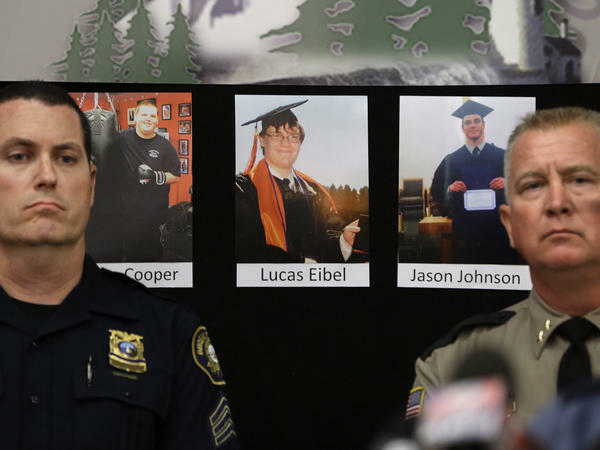 Photos of victims of the mass shooting at Umpqua Community College in Roseburg, Ore., are displayed behind Portland Police Sgt. Peter Simpson (left) and Douglas County Sheriff John Hanlin. "Talking about firearms now is like talking about race," says Richard Beary, chief of police for the University of Central Florida and president of the International Association of Chiefs of Police. "These are difficult conversations, and people get very polarized on each side of it." It's not unusual to see law enforcement executives arguing with each other about guns in public. Take the situation in Milwaukee. The county sheriff, David A. Clarke Jr., is a champion of gun rights; earlier this spring he released a statement attacking the city administration for being "anti-gun" and "anti-Second Amendment," and for "blaming the gun instead of the behavior." Milwaukee's police chief, Edward Flynn, responded to Sheriff Clarke by saying that he wouldn't hold back from talking about guns and how they get into the hands of criminals. "Our bad guys with guns learn nothing because the laws are so weak, and we need help," Flynn said. "And I would like to think that people who think of themselves as advocates for law enforcement could get that through their skull." Jennifer Carlson, an American sociologist at the University of Toronto who studies police attitudes toward gun laws, says this divide has grown since the 1990s. A generation ago, she says, police chiefs made a common cause of legislation such as the Assault Weapons Ban and the Brady bill. "And now you've really seen police not taking as much as a unified stance, at least publicly," she says. "That's been a major shift." She thinks this may have something to do with the expansion of concealed handgun permits, which gun rights groups pushed for especially hard starting in the late 1990s. Police chiefs initially resisted the expansion of the gun permits, but Carlson says many of them changed their minds when they saw that increased permits didn't cause a big increase in shootings. Carlson says that once they got more comfortable with the idea of citizens carrying guns, some police embraced and even profited from the trend. "In Michigan, for example, police are able to certify people," Carlson says. "They can get in the business of running those firearms schools." The differing opinions of law enforcement leaders often mirror an urban-rural divide. Earlier this year, Sheriff John Hanlin of Roseburg — a town of about 22,000 that's more than 70 miles south of Eugene — appeared before a committee of the Oregon Legislature and spoke out against a proposed state bill to expand background checks to private gun sales. "This law is not going to protect citizens of Oregon," he said. "We have laws that prohibit the possession of other things, like methamphetamine, and it doesn't stop it." The bill passed, but not without a bitter political fight, including an attempt by gun rights groups to recall legislators who voted for it. That's why it's understandable that national police organizations tread carefully on the issue of guns. "We don't want to separate ourselves from our communities," says Beary. These days, national police groups are more likely to talk about making existing gun laws work better and finding ways to keep guns out of the hands of the mentally ill — middle-ground positions that can get the support of their divided membership. President Obama visits Roseburg, Ore., today. He meets with the families of the nine people killed in a campus shooting. The town may welcome the president but not all of his message. There may not be much sympathy for his call for tighter gun control. Shortly after the massacre, it was widely reported that the local sheriff opposes more gun control. And that should not be a surprise. Guns are just as divisive for police as for everybody else. Here's NPR's Martin Kaste. MARTIN KASTE, BYLINE: When you ask Richard Beary about gun laws, he picks his words carefully. RICHARD BEARY: Talking about firearms now is like talking about race. KASTE: Beary's a 38-year police veteran as well as the president of the International Association of Chiefs of Police. BEARY: These are difficult conversations. And people get very polarized on each side of it. KASTE: And these days, it's not unusual to see law enforcement executives arguing about guns in public. Take the situation in Milwaukee. The sheriff there, David Clarke Jr., is a champion of gun rights. Here he is on Fox News going after President Obama, accusing him of wanting to restrict people's access to guns. DAVID CLARKE JR.: Here's my challenge to the president of the United States if you think this is so easy. Forego your Secret Service protection for you, for the first lady and your children, and see what it's like to have to fend for yourself. KASTE: And here's Milwaukee's chief of police, Edward Flynn, responding to the sheriff's gun politics by arguing for stricter laws. EDWARD FLYNN: Our bad guys with guns learn nothing 'cause the laws are so weak, and we want help. And I would think people that think of themselves as advocates for law enforcement could get that through their skull. KASTE: Jennifer Carlson is an American sociologist at the University of Toronto who's been studying police attitudes towards gun laws. She says things have changed since the 1990s, when police executives united behind the gun control legislation of the day. JENNIFER CARLSON: The Assault Weapons Ban, the Brady bill. And now what you've really seen is police not really taking as much of a unified stance, at least publicly. That's been a major shift. KASTE: She thinks this shift may have something to do with the expansion of concealed handgun permits in the last decade or so. When the permits didn't result in the widespread mayhem that some chiefs had feared, she says they started getting more comfortable with the idea of citizens carrying guns. CARLSON: In Michigan, for example, police are able to certify people. So if you want to get your pistol license, you have to go through some kind of firearms training. And police can get in the business of actually running those firearms schools. KASTE: Chiefs are still likely to favor more effective background checks for gun buyers. Though, it's on this issue that you find another big fault line. On one side, you have the urban chiefs, and on the other, you have elected sheriffs, especially from rural areas. JOHN HANLIN: Committee Madam Chair, good afternoon. My name is John Hanlin. I am the Douglas County sheriff down in Roseburg. KASTE: This is Sheriff Hanlin earlier this year, speaking at the Oregon Legislature as it considered background checks on private gun sales. HANLIN: This law is not going to protect citizens of Oregon in that it is going to keep guns out of the hands of criminals. It will not do that. We have laws that prohibit the possession of other things like methamphetamine, and it doesn't stop it. KASTE: The bill passed but not without a bitter political fight, including an attempt by gun rights groups to recall legislators who'd voted for it. So it's understandable when national police organizations tread carefully on the issue of guns. Again, Richard Beary of the International Association of Chiefs of Police. BEARY: We don't want to separate ourselves from our communities. So I can't get too involved in the workings of it because my job is to carry out the policy that's been handed to me. KASTE: These days, groups like this are more likely to talk about making existing gun laws work better and finding ways to keep guns out of the hands of the mentally ill - middle-ground positions that can get the support of their divided membership. Martin Kaste, NPR News. Transcript provided by NPR, Copyright NPR.